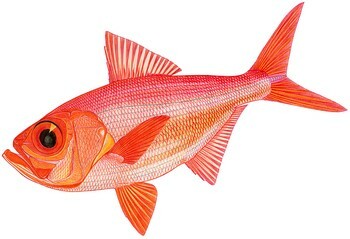 Alfonsino are caught worldwide by countries including New Zealand, Chile, Namibia, Ukraine, and Spain. Catches of alfonsino peaked in 2003 due to unusually large landings in Chile. The landings in New Zealand have increased moderately with time. No alfonsino is imported into the US. Alfonsino are found in three management areas in New Zealand. Population status and fishing mortality are unknown for two of these areas. Management of alfonsino is effective but limited by a lack of data. Some data on alfonsino is however, collected via other fisheries such as the hoki fishery that catch alfonsino incidentally and collect information when this occurs. Scientific recommendations play an important role in the decision-making process for regulations concerning the alfonsino fishery. A large variety of species are caught as bycatch in alfonsino fisheries. Of these, more than 30 species of fish are retained which leads to few discards. However, some species of endangered seabirds such as albatross and petrel are at risk of being caught. This makes bycatch a serious concern. Midwater trawls do not come into contact with the seafloor and are therefore associated with minimal habitat damage. A large variety of species are caught as bycatch in alfonsino fisheries. Of these, more than 30 species of fish are retained which leads to few discards. However, some species of endangered seabirds such as albatross and petrel are at risk of being caught. This makes bycatch a serious concern. Bottom trawls are seriously damaging to the habitat. Bottom trawls are known to cause sediment resuspension, physical alteration of the habitat, the snagging and breaking of coral, as well as injury and possible mortality of organisms. Midwater trawls do not typically contact the seafloor and therefore are less of a concern.